One fish, two fish, red fish… LET’S FISH! The season is here and it’s heating up quicker than we can even comprehend. And we absolutely, positively LOVE it! Photo from Talon Air Service – July 2015. This is what we love about July. Lots of fun outdoorsy chaos and lots of action. It starts out peaceful and patriotic and then all of a sudden, BOOM… the streets are packed with visitors and the river is packed with anglers. 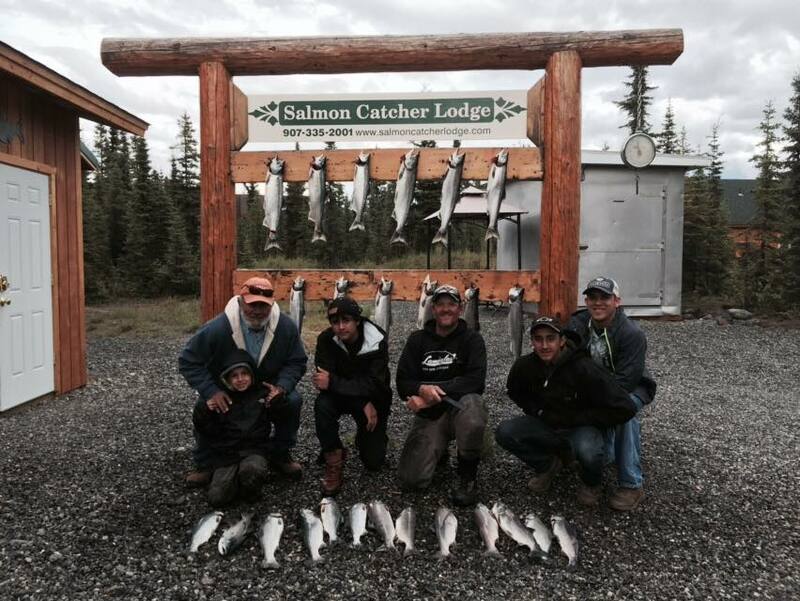 Photo from Alaska Fishing Charters and Soldotna B&B Lodge – July 2015. Although it’s always an adjustment to go from having such a slow passed town to having so much traffic, we are very grateful to live in an area that has such a prominent and thriving tourism industry. The Kenai River on Alaska’s Playground is one of the most beautiful places in the world and we are very happy to share it with fellow angling enthusiasts from all over the world. Photo from Angler’s Lodge – July 2015. The Kenai River is the most heavily fished river in Alaska is is world famous for its natural beauty and incredible fishery. The Kenai is a glacial stream draining the central Kenai Peninsula. Kenai Lake narrows into the Kenai River near the community of Cooper Landing. It meanders through slack water for approximately six miles, crossing gravel riffles before narrowing again into a stream of greater, yet still gentle, gradient. 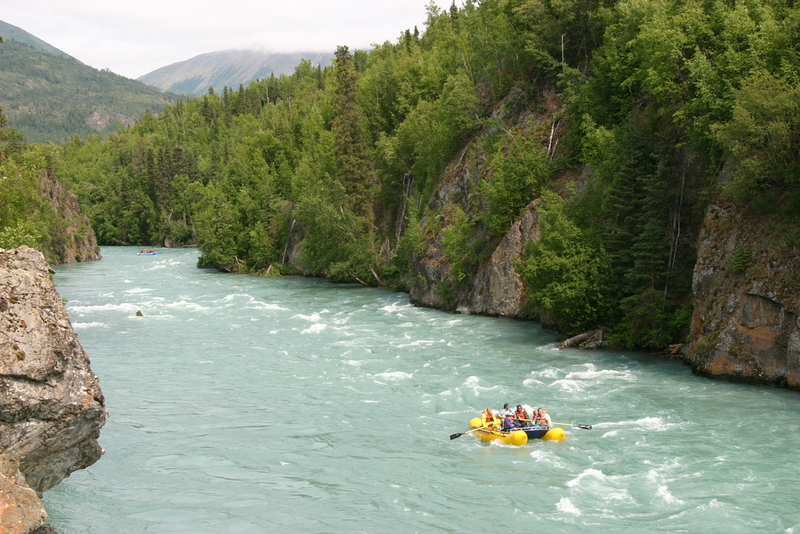 This continues for about another six miles before tumbling through the “Kenai Canyon” which is two miles of fast river with whitewater enough to excite even the more experienced floaters and kayakers. After leaving Skilak Lake, the river travels for 10.5 miles at a gradient of 3.3 ft/mi before encountering the Naptowne Rapids. These rapids are about 1 mile long on a slightly greater gradient and contains many large rocks. Only experienced boat operators using a powered craft should attempt this run, especially when the water levels increase around this time of the year. Photo from Great Alaska Adventure Lodge. Downstream of the rapids, the river is faster and continues to have many large boulders. This section (typically called the “Mid-River” section) is 19.5 miles in length with a gradient of 5.4 ft/mi. It is very safe to negotiate, but it is of course always smart to use caution. 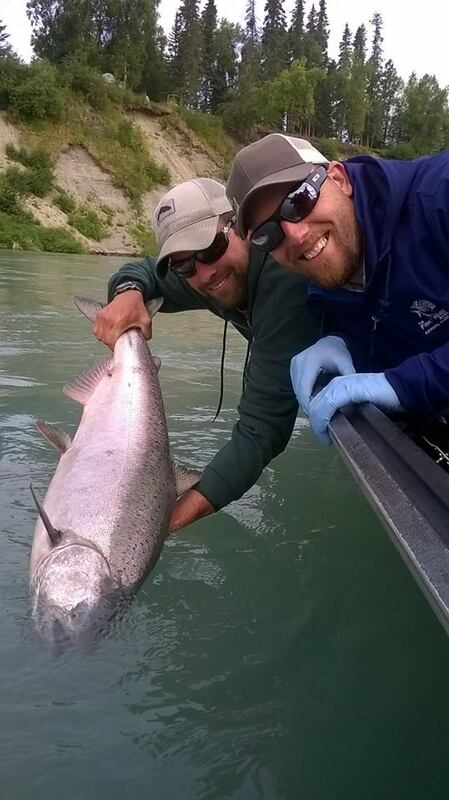 King Salmon on the Lower Kenai River – July 2015. 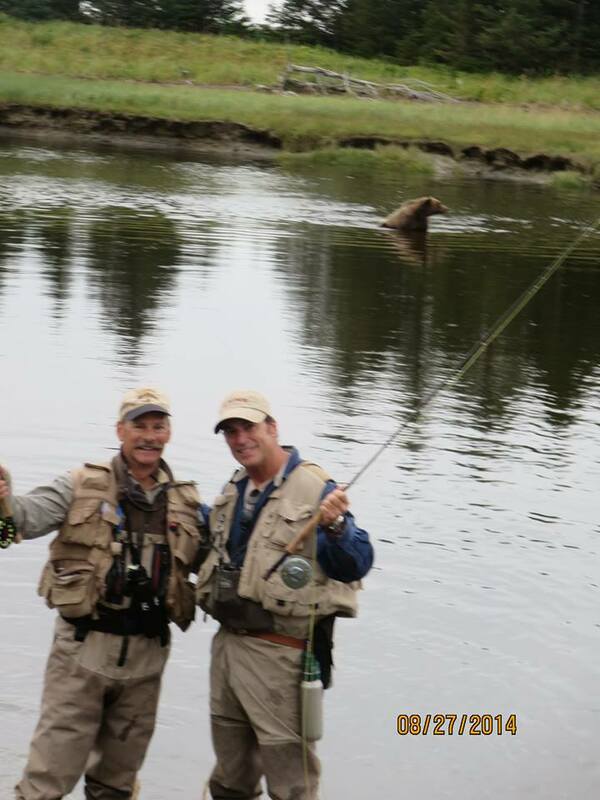 Photo from Kenai Riverside Fishing. The Sterling Highway bridge in “Alaska’s Kenai River City” of Soldotna marks the beginning of the “Lower River.” This final 21 mile section is gentler, and the river winds its way to empty into Cook Inlet near the city of Kenai. The final 12 miles of this section are tidally-influenced due to the proximity to the inlet. There are 40 unique species of fish in the Kenai River. These are resident fish, which spend their entire life cycle in the river; “anadromous” fish, which spend part of their life in the river and part in the salt water; and fish which are common to the intertidal area, which is a mixture of both fresh and salt water. Photo from Big Sky Charter and Fishcamp. 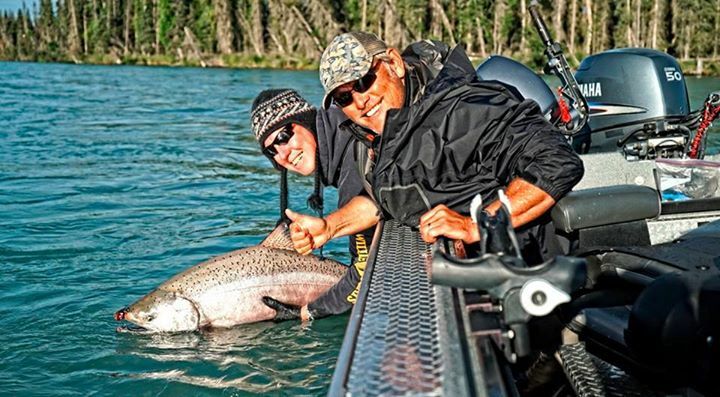 The Kenai River is the most popular sport fishing destination in Alaska, particularly for King (or Chinook) Salmon. Each year there are two runs each of King Salmon, Silver Salmon, Red Salmon, plus a run of Pink Salmon every other year. Pink Salmon run on even years, so the next good run will be in 2016. Photo from Alaska Rivers Company – July 2015. The world record king salmon, which weighed about 44 kg (97 lb), was caught in the Kenai River in 1985. 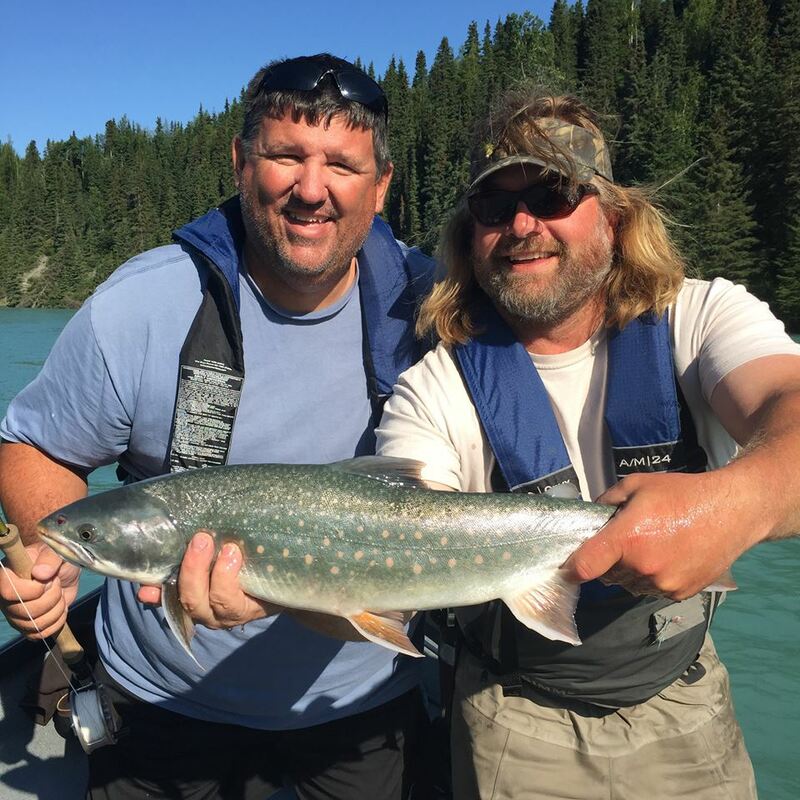 The Kenai is also the home of trophy size Rainbow Trout and Dolly Varden. Stretching to sizes over 76.2 cm (30 inches). 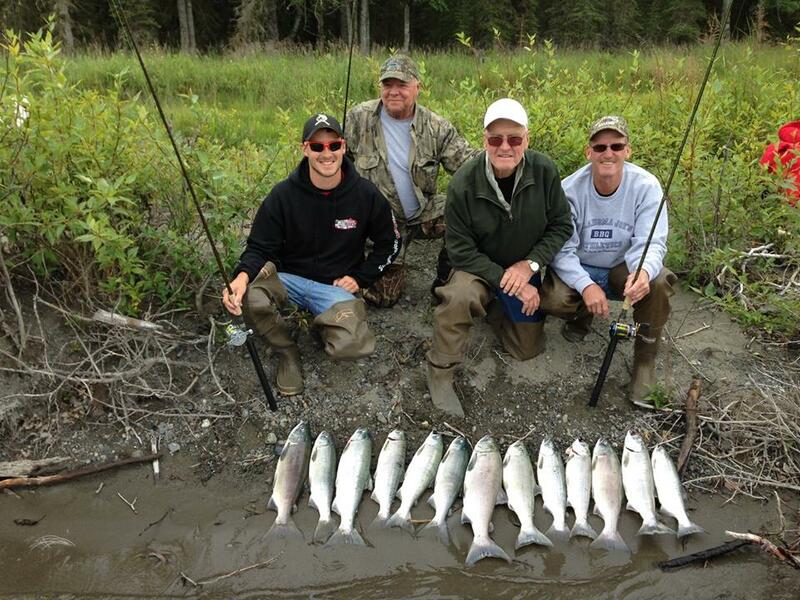 Occasionally there will be reports of catching of “Steelhead”(Sea-run Trout) on the Kenai River. Big Dolly Varden! Photo from Jason’s Guide Service. The upper Kenai River is home to trophy-sized wild rainbow trout, and “off-season” fishing is a fly fishing angler’s dream. 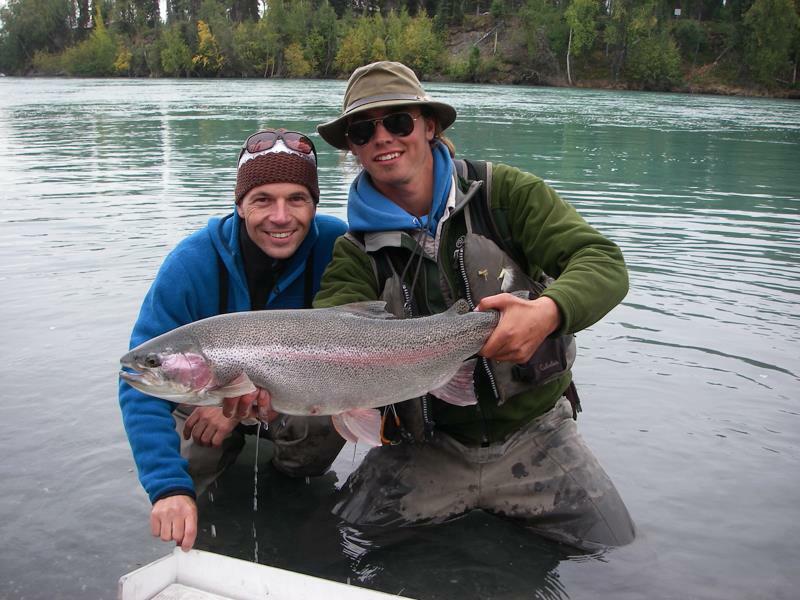 The majority of Kenai River rainbows are year-round residents of the Kenai River. About 43,000 rainbow and steelhead are caught every year by anglers, with 95% being catch and release. Photo from Alaska’s Angling Addiction. 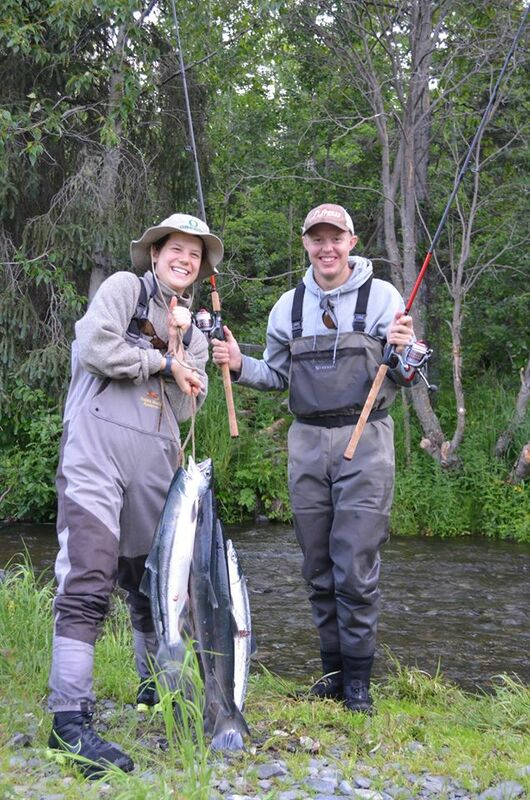 King fishing is off to a great start on the Kenai River. 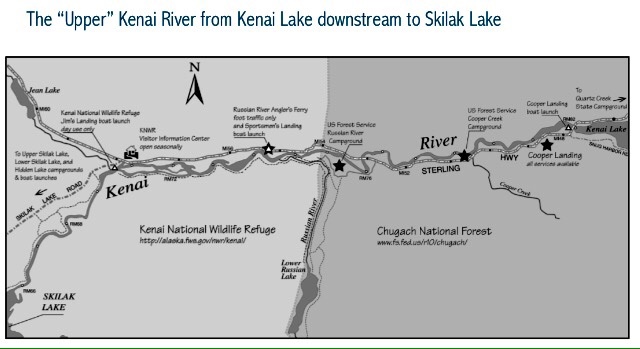 In fact, tomorrow morning at 12:01am, Saturday, July 25, the use of bait/scent in the Kenai River will be allowed from its mouth, upstream to regulatory markers located at the outlet of Skilak Lake. King salmon fishing will remain restricted to those waters downstream ADF&G markers located approximately 300 yards downstream of Slikok Creek. For a list of the latest regulations, be sure to check out the ADFG website HERE. For a list of great guide services, be sure to check out our website Kenai Peninsula Fishing Guides. Photo from EZ Limit Guide Service. 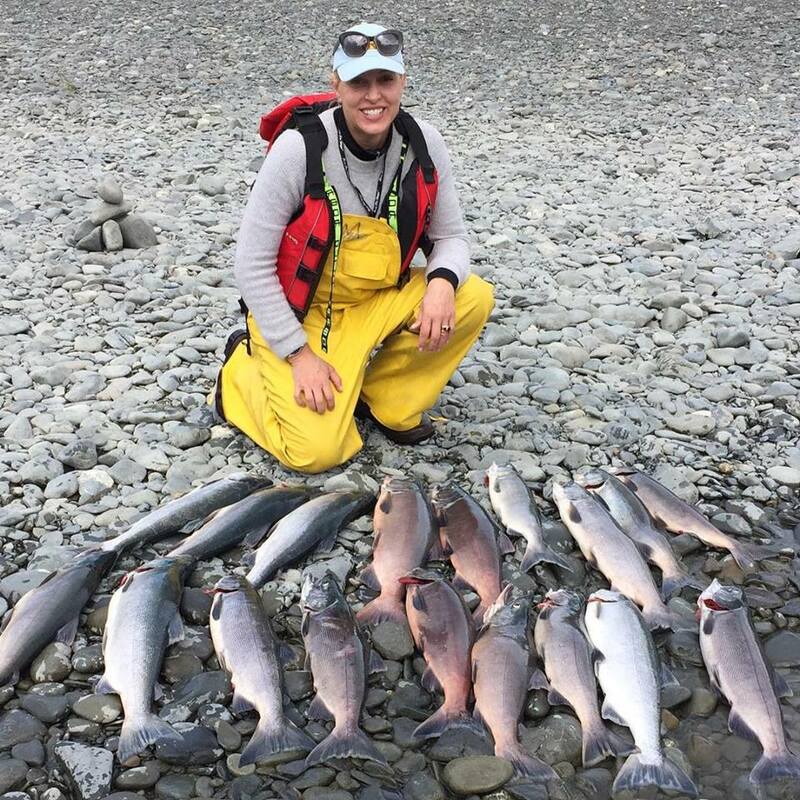 Right now, the “reds” are continuing to come in strong on the Kenai River. For a list of the latest regulations, be sure to check out the ADFG website HERE. For a list of great guide services, be sure to check out our website Kenai Peninsula Fishing Guides. 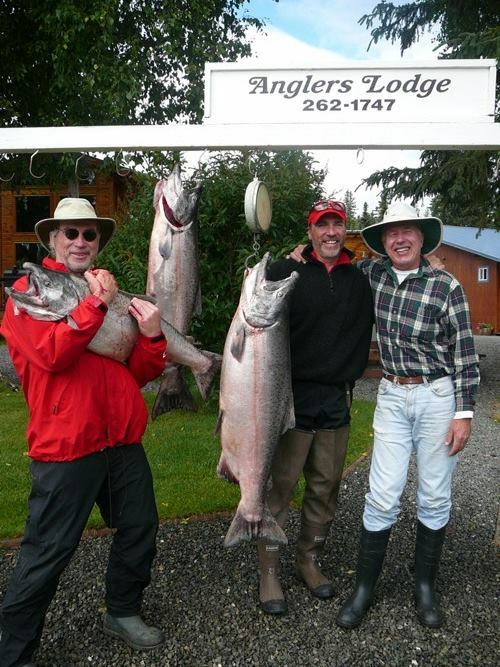 Photo from Salmon Catcher Lodge. Hopefully if you weren’t already, you are now as excited as we are to “punch out” and wet a line! Have a safe, fun weekend out there friends! 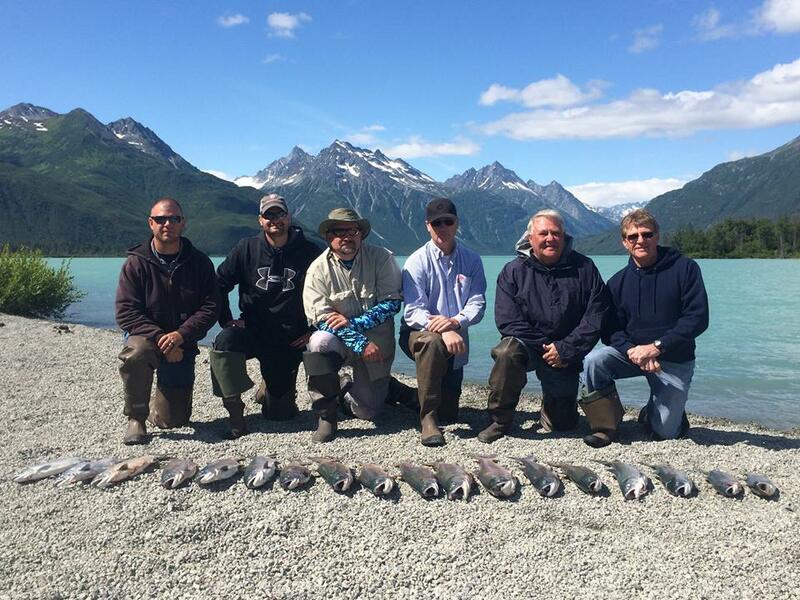 Photo from Captain Bligh’s Kenai River Lodge & Guide Service. Photo from Alaska West in Nikiski, AK. Taking a flight-seeing excursion up and above glaciers, fjords, mountains and endless wildlife is certainly a once in a lifetime experience. We might be a little partial, but we believe that nothing can offer you the diverse landscape, wildlife and breathtaking views quite like the outfits on The Kenai, Alaska’s Playground. Below are some of our top picks in Homer, Seward, Soldotna and Kenai/Nikiski. Photo from AA Seward Air Tours in Seward, AK. Homer Air in Homer, Alaska offers a variety of air services for their wide range of customers. From the village commuter to the lucky few who visit Alaska for their one-of-a-kind adventure, we provide a tailored, professional flight service. View them below or consult with our management staff to help you decide on the perfect aerial opportunity. Their “adventure services” include bear viewing, fly-out fishing, flight-seeing, beach combing and fossil hunting. Photo from Homer Air in Homer, AK. Another great option in Homer is Inlet Charters Across Alaska Adventures. This is the type of adventure outfit that does a little bit of everything, and does it very well! Services include halibut charters, salmon charters, combo charters, sea kayaking, bear viewing and eco tours. The unforgettable 1.5 hour flight-seeing trip to go bear viewing will fly you by float plane where you will then land in Katmai National Park or coastal Alaska where your pilot will stay with you for the entire day and guarantees that you will see bears. These bears have never been hunted by humans which truly allows the viewer an exceptional opportunity to see an amazing creature up close. An estimated 4,000 Alaskan brown bear inhabit this immense park and it is home to the largest undisturbed population of bears in the world. Photo from Inlet Charters Across Alaska Adventures in Homer, AK. Alaska Wild Bear Adventures is another spectacular option in Homer. Join the Alaska Wild Bear Adventures team and fly to Katmai National Park, Lake Clark National Park or Brooks River Falls where you can safely walk among grizzly bears, and often wolves, in their natural habitat. They also provide guided fishing, flight seeing and beach combing. Half the fun during any of these adventures is getting there. You will get to fly along Alaska’s beautiful coastline while taking in views of active steaming volcano’s and huge glacier covered mountains that literally climb right out of the ocean. Imagine landing on a beach at the base a 10,000 foot active volcano or a pristine mountain lake 100 miles from the nearest road! Photo from Alaska Wild Bear Adventures in Homer, AK. Talon Air Service in Soldotna, AK specializes in offering affordable wilderness fun on the Kenai Peninsula. Whether you’re an avid fisherman, hunter or you just want to see the vast Alaska Wilderness from a birds-eye view, they can customize a trip to meet your outdoor desires. With over 30 years of Alaska wilderness experience, their pilot and guides have the know-how to make it happen. Float planes are an essential piece of equipment for enjoying the wilderness in Alaska and are often the only way to escape the throngs of crowds found in the more accessible areas. Utilizing the float plane lets Talon Air Service offer the thrill of a lifetime in a single day trip and have you back at your chosen lodging that same evening. They offer fly-in fishing packages, big game hunting packages, bear viewing and sightseeing packages. Photo from Talon Air Service in Soldotna, AK. Below is a photo from one of the fly-in trips we took last year with Talon Air Service. We believe that at least one fly-in a year is good for the soul. But a handful of fly-in’s is definitely preferred! It is just way too much fun and so nice to be in a secluded piece of paradise away from the crowds. Photo on a fly out with Talon Air Service at Wolverine Creek. Natron Air is a statewide air taxi service located on Alaska’s Kenai Peninsula at the Soldotna Airport. Natron Air is owned and operated by Tim and Janet Pope, year round Alaskan residents. 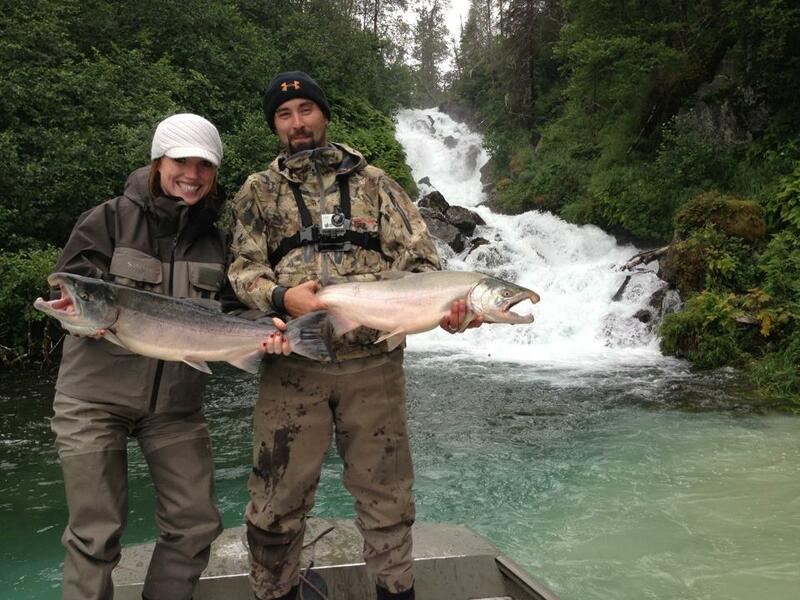 They offer Alaska salmon fishing, bear viewing, photography/sightseeing tours and unguided drop hunts. They offer unforgettable flights that will leave you with lasting memories. 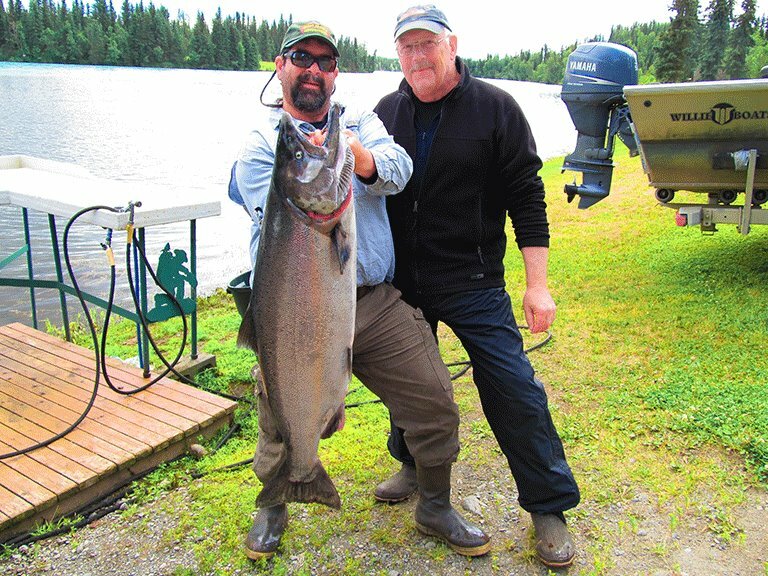 Their bear viewing tours and salmon fishing trips are deemed to be “unsurpassed.” Many of their guests tell them that their fly out trip was the best part of their Alaska vacation. They can also help you plan your Alaska hunting trip. Tim Pope is your pilot with ratings as an Airline Transport Pilot/Multi-Engine Instrument, with thousands of accident free hours. You will be flying in a 2002 GA-8 Air Van certified to the highest FAA safety standards, designed for passenger comfort, each seat with a “bubble” style window for ease of viewing wildlife and scenery. They operate Sunday thru Friday year round. If you are looking for a once-in-a-lifetime experience, be sure to consider Natron Air in Alaska’s Kenai River City. Photo from Natron Air in Soldotna, AK. 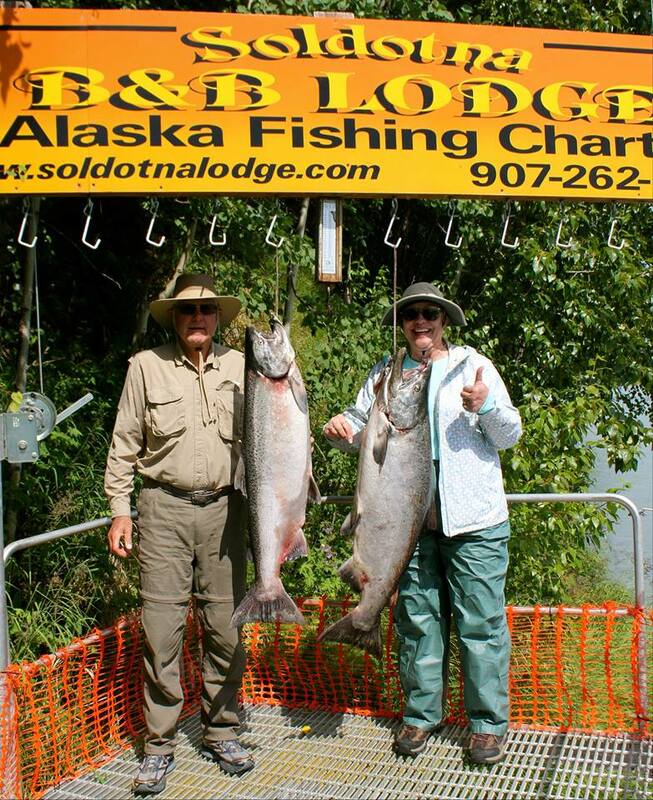 All Alaska Outdoors Lodge in Soldotna, AK has many options for the ecotour minded person in your group. Their Float Plane Fly In is an excellent option for Close-up Bear viewing and photography. The Crescent Lake Fly In is offered specifically for Bear Viewing. The locations they visit on the Wheeled Plane Fly In are excellent places to see Brown Bears in a very beautiful coastal setting in Lake Clark National Park. The Ultimate Expedition provides amazing aerial flight seeing. They have several venues that put you over large concentrations of Brown Bears and Coastal Seals and we excel at finding that Trophy Bull Moose, Dall Sheep or Caribou Herd you’re wanting to see. At several of the destinations you can view and photograph Black and Brown Bears, Eagles, Sea Otters and breathtaking scenery in an exclusive setting. They often have resident Moose Cows and Calves visit our lake front facility. Paddling one of our Mad River Canoes on our mile long lake will undoubtedly provide you the opportunity to approach one of their Loon families at close range. The Marine Life Viewing on one of our Deep Sea Combo Trips is reason enough to go but we trust you won’t mind the fillets you’ll take home. Photo from All Alaska Outdoors Lodge in Soldotna, AK. Another wonderful option in Soldotna is High Adventure Air Charters. We did a full blog on this great company last year during silver salmon fishing season. If you missed it, you can check it out HERE. High Adventure Air Charters is a family owned and operated. 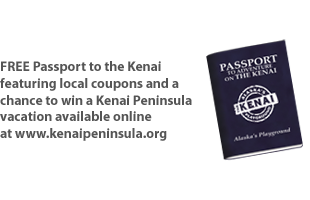 Owners Sandy, Mark and Greg Bell are based in Soldotna in the heart of the beautiful Kenai Peninsula. They promise you the best fly in fishing and flightseeing opportunities to be found. Their wings cover over 30,000 square miles of Alaska’s best. With more than a quarter century of safe, reliable service, High Adventure Air Charters offers a large selection of fly in fishing trips and wilderness adventures. Photo from High Adventure Air Charters in Soldotna, AK. 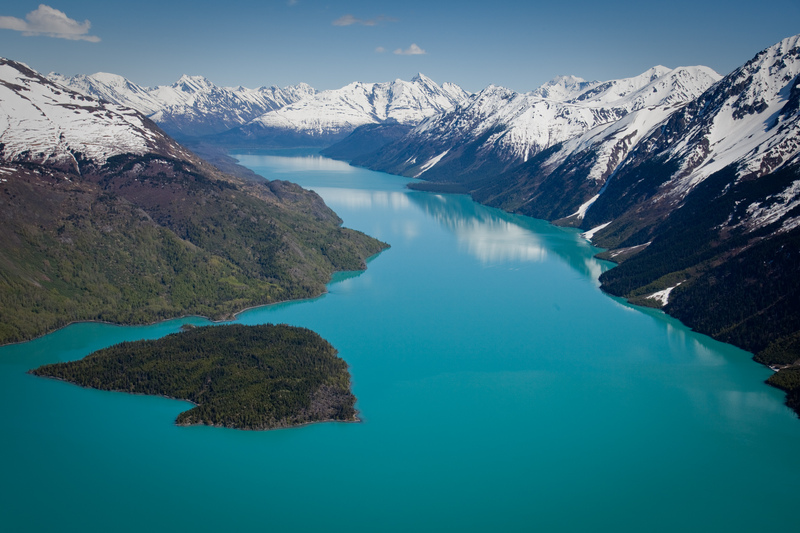 AA Seward Air Tours in Seward, Alaska offers scenic flights over mountains, glaciers, fjords and an endless amount of wildlife from land to sea. Alaska is alive and vibrant with a wide variety of animals that are easily view-able from their airplane. Every scenic flight will potentially show you mountain goats, black bears, grizzlies, harbor seals, eagles and moose. Even whales are sometimes seen from the air. If you are looking for a truly magical experience atop the beautiful town of Seward… look no further than AA Seward Air Tours! Alaska West Air in Nikiski, AK (just north of Kenai) says “It’s not everyday that you embark on your adventure of a lifetime. So, why fly with any air taxi service when you could fly-out with the best? Flying anglers, hunters, hikers, rock climbers, bear viewers, and photographers for 27 years.” Fly in their Turbine Otter, DeHavilland Turbine Beaver, PA-18 SuperCub or DeHavilland Piston Beaver. This is an excellent option in the central peninsula area if you are looking to get above it all and reach a secluded destination away from all the crowds. Because really, if you’re in Alaska… you gotta GO BIG (or go home)! Photo from Alaska West Air in Nikiski, AK.